The new 38.4 metre Tansu motor yacht Tigershark One has been sold with the buyer introduced by independent yacht consultant Neil Cheston. Currently under construction in wood by Turkish yard Tansu Yachts with naval architecture by Diana Yacht Design, Tigershark One will be ready for delivery 12 to 14 months from contract signature with the interior still fully open to the new owner’s design. 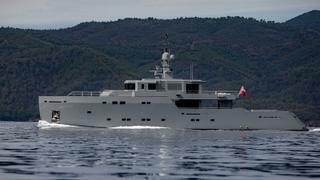 The new build will be the first of the Tigershark platform which the Turkish yard has been working on for some time. The concept offers much flexibility in terms of planning each yacht’s interior space, giving owners the chance to put their own stamp on their model, with different layout configurations available. She can have a full beam main deck master suite plus either a double and two twin cabins on the lower deck for a four cabin layout or two doubles and two twins on the lower deck and a further double on the bridge deck for a six cabin layout. Twin 830hp Caterpillar diesel engines will allow a cruising speed of 13.5 knots topping out at 16 knots and a range of 3,500 nautical miles. For added stability and comfort, she will be fitted with CMC zero speed stabilisers. Tigershark One was asking €7,000,000.